Draw samples from a Gumbel distribution with specified location (or mean) and scale (or standard deviation). The Gumbel (or Smallest Extreme Value (SEV) or the Smallest Extreme Value Type I) distribution is one of a class of Generalized Extreme Value (GEV) distributions used in modeling extreme value problems. 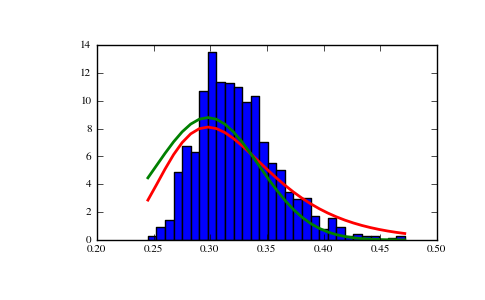 The Gumbel is a special case of the Extreme Value Type I distribution for maximums from distributions with “exponential-like” tails, it may be derived by considering a Gaussian process of measurements, and generating the pdf for the maximum values from that set of measurements (see examples). The location of the mode of the distribution. 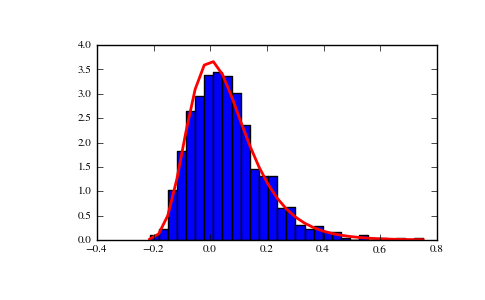 The scale parameter of the distribution. 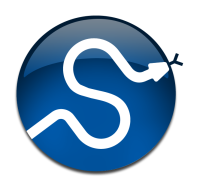 where is the mode, a location parameter, and is the scale parameter. The Gumbel (named for German mathematician Emil Julius Gumbel) was used very early in the hydrology literature, for modeling the occurrence of flood events. It is also used for modeling maximum wind speed and rainfall rates. It is a “fat-tailed” distribution - the probability of an event in the tail of the distribution is larger than if one used a Gaussian, hence the surprisingly frequent occurrence of 100-year floods. Floods were initially modeled as a Gaussian process, which underestimated the frequency of extreme events. It is one of a class of extreme value distributions, the Generalized Extreme Value (GEV) distributions, which also includes the Weibull and Frechet. The function has a mean of and a variance of . [R72] Gumbel, E.J. (1958). Statistics of Extremes. Columbia University Press. [R73] Reiss, R.-D. and Thomas M. (2001), Statistical Analysis of Extreme Values, from Insurance, Finance, Hydrology and Other Fields, Birkhauser Verlag, Basel: Boston : Berlin.